With just 2 weeks to AHM, the Kingfishers were all decked out in their race day gear for a time trial of the actual distance and target pace. 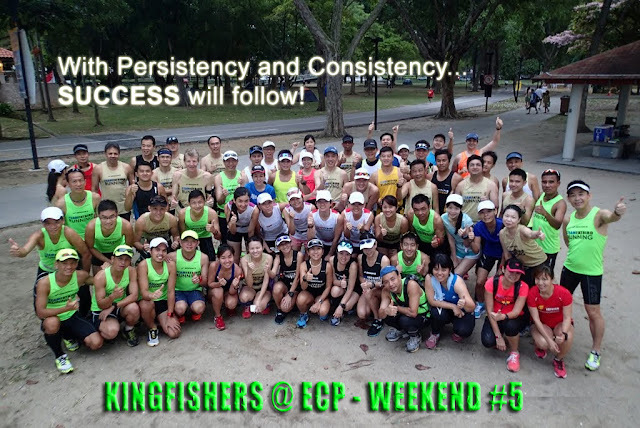 Because of a triathlon event along the Northern part of ECP, we made some modifications to our time trial route and in the end, it proved to be smooth sailing for the runners in spite of the slightly more challenging access. The weather was good with good cloud cover, enabling the respective groups to maintain Optimal Pace for a good 8 km through 10 km before feeling some effects of fatigue and lactate buildup in the legs. The trainers and pacers led very well from the start, and with their bright green Brooks attire, were visible from a distance away. There was an air of seriousness as the Kingfishers were focused on the optimal race pace at hand, which was close or at Tempo pace for many. It was nice to see the groups sticking together even after the first lap, which could only mean that the runners were able to sustain an achievable pace till then. After 12 km, their immediate goal was to sustain Optimal Pace for as much as possible, preferable till the end of the 21 km distance target. Most were able to continue well through 17 km, with many able to clear the requirement with flying colours – a testament to their readiness to score good performances on 1 September. With the Kingfishers returning within cut-off time, we managed to end the training session early and everyone had worked up such a hunger that brunch was the next thing on their minds – and they well deserve a good treatment and some pampering to ease their fatigue from the past few weeks of hard running. After achieving a peak in our training, the Kingfishers now look forward to the next 2 weeks of tapering and preparing for the race. Time now to have a good lube, sports massage, foam-rolling to knead off any kinks and knots in the tightened muscles – putting ourselves in tip-top condition. The Kingfishers Have Passed The Time Trial With Flying Colours!